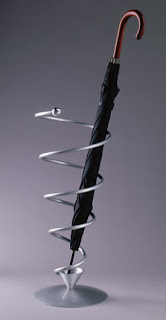 Now that the rains have begun in the San Francisco Bay Area, umbrella stands are catching my attention. You can certainly get fine ones at places like Stacks and Stacks, Bellacor, or even Amazon.com - but here are some more unusual options, in a wide range of prices. 1. 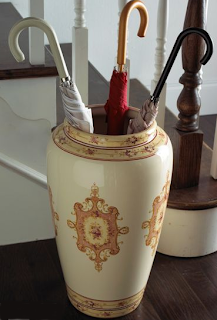 Italian ceramic umbrella holders are available from a number of sources, and can be stunning. 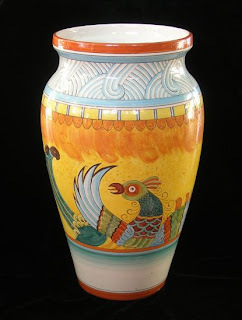 The bird of paradise umbrella stand shown above, made from Majolica glazed pottery, is just one example. Update on Nov. 11, 2009: Unfortunately, Bellezza no longer carries this specific product. 2. 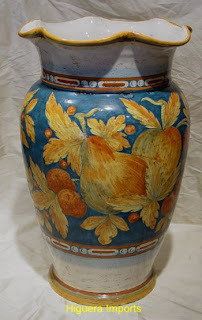 Here's another Italian ceramic umbrella stand in a very different style. Update on Dec. 26, 2012: I'm no longer finding this product. 3. 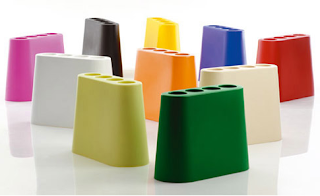 And Higuera Imports has an interesting selection of umbrella stands from Deruta, Italy. 4. Moving over to the U.K., here's a willow umbrella basket. There's a version without a handle, too. This is one of the less expensive options listed here. 5. 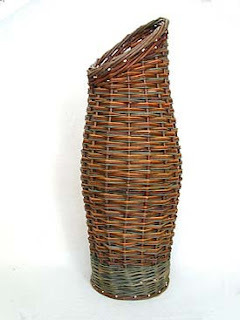 And here's a willow umbrella basket in an urn shape. 6. 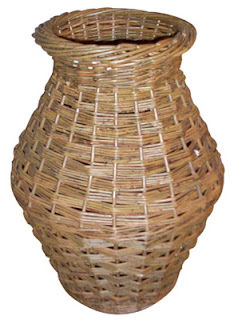 This unusually shaped willow umbrella holder is made by a French master vanneur, or basketmaker. Update on Nov. 11, 2010: The site that sold this product no longer seems to carry it. 7. And of course you can also get umbrella baskets made in the USA. 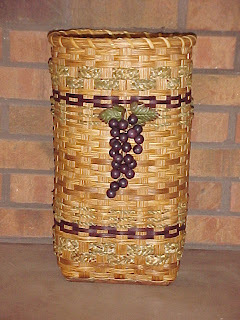 The one above comes from Baskets by PamW costs $41; other sources are The Basket Man, Annie's Amish Baskets, and Peterboro Basket Company. Update on Nov. 11, 2010: Baskets by PamW seems to have disappeared from the web, and Peterboro Basket Company doesn't seem to sell an umbrella basket any more. 10. 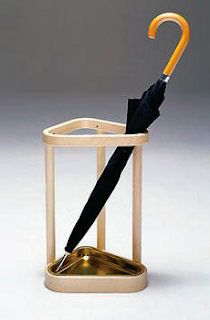 This umbrella stand is made in Finland; it's birch, with a brass tray. It was designed by Alvar Aalto. 11. 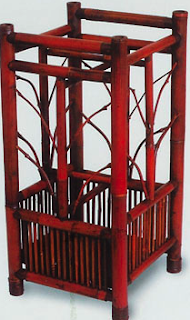 Here's a bamboo umbrella stand; there's also a smaller version. 12. 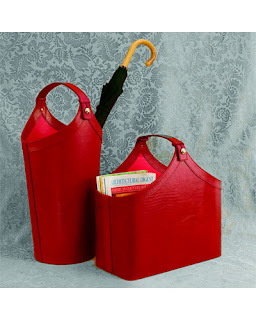 And here's a leather umbrella stand; it's only available in red. 13. 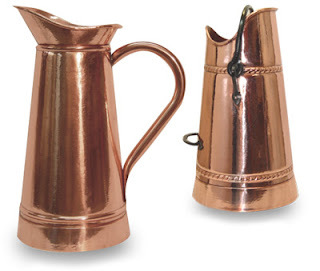 These French copper umbrella stands sure look stunning. 14. 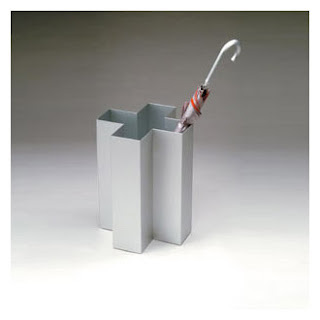 The Raining in Sils umbrella stand is made of aluminum, and shaped like a Swiss cross. [via Bonluxat] Update on Dec. 26, 2012: I'm no longer finding this one. 15. 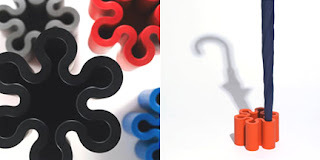 The Magnuson Group has a number of umbrella stands worth a look. 16. The Well Appointed House has many umbrella stands in all sorts of styles; it was hard to select just one image! 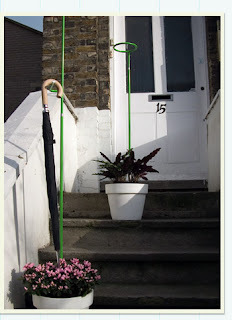 Update on Dec. 26, 2012: The Well Appointer House still has many umbrella stands, but not this one. 17. 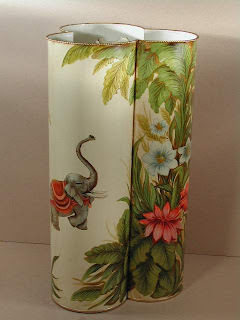 Mary Alice Hadley made this umbrella stand. 18. Want to go green? 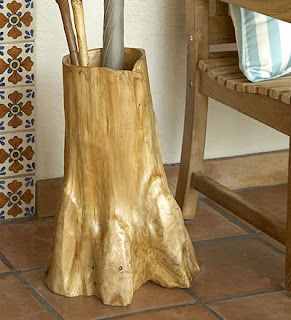 This umbrella stand is hand-carved from reclaimed root balls. Update on Nov. 11, 2010: Plow & Hearth doesn't have this product any more. 20. 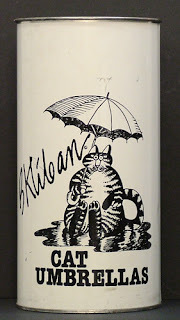 This one is not for sale - but I just couldn't resist showing you the Kliban cat umbrella stand. Update on Dec. 26, 2012: The site where I found this image no longer has it. Did you guess which one cost $700? 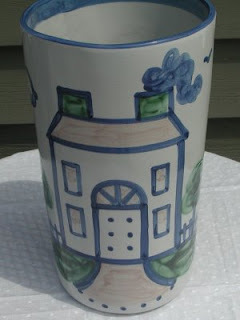 It's the Italian ceramic listed at #2; the other Italian pieces cost much less. 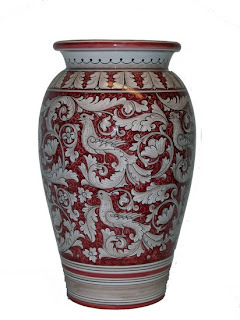 And here's one more, just because I couldn't resist showing what you can get for $1,999: an Italian ceramic umbrella stand from Neiman Marcus. Update on Nov. 11, 2010: Neiman Marcus still sells a few umbrella stands, but nothing in this price range.